Based illegally on Bram Stoker’s Dracula, F. W. Murnau’s film is undeniably the best and probably the most faithful of the myriad of films based on the novel. Naively, the film’s producers attempted to circumvent the author’s estate’s copyright by changing the names and central location of the film. London became Wisborg, Count Dracula is called Graf Orlock, Jonathan Harker became Hutter and his wife Mina was named Ellen, and so on. Ironically, in all prints struck over the last few decades, the names (apart from the location, for obvious reasons) have reverted to the originals of Stoker’s novel. Made on a tiny budget by Praha-Film, as the first of an ambitious slate of occult films, an overzealous spending on promotion sent the film rapidly into debt, limiting its distribution potential. Add to this, a tenacious perseverance on the part of Stoker’s wife Florence to protect her copyright (who almost saw to the destruction of all prints of the film when the original negative was destroyed after a court decision). Certainly, the novice producers, businessman Enrico Dieckmann and designer, painter, architect, and occultist Albin Grau, who was the film’s art director (costumes and sets) and story board artist, were familiar with Stoker’s novel. The title of the film comes allegedly from the Romanian word for the undead, and The Undead was the working title of Stoker’s book. The Carpathian Mountains, in Romania, is where Dracula lives prior to his relocating. Nosferatu‘s scriptwriter Henrik Galeen, had previously gained a reputation for his horror/fantasy and Expressionistic work through his co-direction and scripting of the 1914 version of Der Golem and Der Student von Prague (1920) and his script for the 1920 version of Der Golem. Later he was to script Waxworks (1924) and write and direct Alraune (1927), cementing his position as the major collaborator on all of the best German fantasy films. His technique for maintaining the multiple perspectives and the fragmentary nature of Stoker’s novel was to frame the story as the chronicle of an unidentified narrator, inserting texts, letters, newspaper clippings, diary and log book entries and documentary footage similar in style to the arachnid footage later used by Buñuel in L’Age d’Or (1930). (1) Murnau further added to this fragmentation with an extensive and complex use of cross-cutting between scenes. Whereas Stoker’s novel is contemporaneous (1897), Galeen’s script is set at the time of “The Great Death in Wisborg in the year 1843 A.D.” In the English language version, the intertitles have altered the location and era to Bremen, 1838, with the historian’s name given as Johann Cavallius. The English language version alters several other plot details and sadly, loses the lyrical, Expressionistic character of Galeen’s original intertitles. The original has, as Eisner notes, “oddly-broken lines. prolific use of exclamation marks, words in capitals, and letter-spaced lower-case matter. [a] staccato rhythm. with its incomplete sentences, clauses, phrases and idiosyncratic punctuation.” (2) For simplicity’s sake the remainder of the article will refer to the film’s location as Bremen. The positing of the story back in time by fifty years and the location shooting necessitated by the film’s low budget had a profound effect upon the look of the film. Whereas Stoker’s novel invokes Jack the Ripper, who operated in London in the late 1880s, Murnau’s film conjures up the mediaeval Europe of the Plague. The film had, even at the time of its release, “the patina of antiquity”, a look that Murnau created through the careful choice of locations. (3) Location filming was rare in Germany at the time of the film’s production, but this allowed Murnau to suitably combine the two contradictory elements which exist in most of his work: expressionism and realism. Murnau was greatly influenced by the Swedish director Victor Sjöström in his use of the environment as a vital character in the drama of a film, and this is no better displayed than in this film. The busy, cluttered detail of Murnau’s Transylvania and Bremen wreaks of old world decay and menace. These are the kind of locations where Dracula would feel at home, and his Bremen residence looks condemned. This appearance was achieved without the use of chiaroscuro lighting effects usually associated with German horror. Fritz Arno Wagner’s use of shadows is very effective but surprisingly controlled considering the nature of the tale. The film begins very conventionally. The initial exposition is uni-linear, realistic and pedestrian. It is only after the vampire appears that the tone changes and the cross-cutting begins. The precise sense of place is set dialectically against, although not always successfully, optical effects (speeded-up motion, stop-motion photography, superimpositions, and the use of negative), heavy make-up and Expressionist performances. The almost contradictory dichotomy of filmic realism partnered with Expressionist acting exists elsewhere in Murnau’s work. This can produce profound results, as it does with Emil Jannings characterisations in Der Letzte Mann (1924) and Faust (1926), and with Max Schreck in the second half of Nosferatu, or it can unbalance the film as occurs with George O’Brien and Max Schreck, in the earlier stages of Sunrise (1927) and Nosferatu respectively. This may not be Schreck’s fault. His performance is very restrained throughout. Schreck’s make-up early in the film appears theatrical, but as the film progresses, this becomes more subtle and believable, perhaps developing with the skill of the make-up artist, culminating in the powerful images of the vampire that are commonly reproduced. Max Schreck’s role as the vampire was for many years after the completion of the film shrouded in legend, probably, in no small part due to Schreck’s apt name (Schreck translates from German as fright, fear, terror, horror). Some believed, or were encouraged to believe, that Murnau had taken the role or that The Count was playing himself. Such tales are unfortunately untrue. Schreck may have been given the role because of his name, but he had been associated with Max Reinhardt’s Berlin company, as had many of Murnau’s collaborators. Schreck had an undistinguished film career apart from his role as the vampire, appearing in Murnau’s The Grand Duke’s Finances the year after Nosferatu. Murnau himself had been a student of, then actor and finally assistant to Reinhardt before the war, taking up filmmaking in 1919. Murnau was a perfectionist and a name alone would not have been sufficient reason to cast someone in a pivotal role. Schreck’s emaciated, ungainly appearance, combined with his character’s rodent-like features and the vampire’s lengthening fingernails creates cinema’s ugliest vampire, and fits with the film’s aesthetic and theme of the vampire as the contagion of the epidemic that spread throughout Europe (vampire = rats); as a symbol of a diseased and corrupted aristocracy feeding off the vitality and youth of the young. This is different from the novel where the vampire is a suave and sophisticated seducer who is more akin to the sexual threat of Hammer’s Christopher Lee. Here the relationship is more predatory than sexual. This is the natural order. The fatal disease is due to the parasite feeding off the living. Dr. Van Helsing shows his students a Venus fly-trap devouring a fly and a polyp with mouth and tentacles consuming its live victim. Life is the fear of death and disease. Lotte Eisner draws a parallel between the dire influence of the vampire, and Murnau’s personally traumatic struggle with his homosexuality and with Germany’s repressive turn of the century legal code and moral climate which lent itself to the possibilities of blackmail. (4) Homosexuality may have been an implicit theme of vampire lore, but the repressive nature of the German state made it difficult to raise this theme. Throughout the film, Murnau draws a fateful triangle between Dracula, Harker and Mina. At one point, as the vampire and Harker race to Bremen where Mina waits, Mina states, “He’s coming. I must go out to meet him.” The ‘he’ is made ambiguous, and this ambiguity has already been suggested earlier in the film where cross-cutting makes it appear that Mina is beckoning the vampire into her arms. He has already stated that she has a lovely neck and, at the conclusion of the film it is Mina’s sacrifice that destroys the vampire. In Stoker it is Mina that must be saved, but here it is Mina that ends the tyranny. 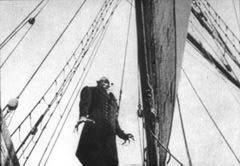 Whereas Stoker’s vampire is killed by a stake, Nosferatu introduced the device of the vampire who is destroyed by the sun’s rays and where Stoker’s vampire casts no shadow, Murnau’s does throughout to great dramatic effect. At the climax of the film, the shadow of the vampire’s hand grasps at Mina’s heart and she arches in pain. Murnau may have broken the laws of vampires, but he has obeyed the laws of the cinema. This is shown to be Galeen’s contribution and not Murnau’s by a reading of Galeen’s script included in the English translation of Lotte H. Eisner’s Murnau, Cinema 2, Secker & Warburg, London 1973, pp. 228-70. Murnau’s alterations are indicated in bold in the text. Carlos Clarens, An Illustrated History of the Horror Film, Capricorn Books, New York, 1968, p. 23. Lotte H. Eisner, The Haunted Screen, Cinema 2, Secker & Warburg, London, 1973, p. 98.